Your lifestyle will turn into constant comfort and convenience thanks to the Ancona Svelte Rounded 40 inch Wall Mounted Hard Wire electric towel warmer and drying rack. The meticulous design provides 13 racks for luxuriously warm towels after showering, as well as drying them after use, keeping them fresh between laundering. The Svelte Rounded Hard Wire includes the additional feature of a 24 hour 7-day digital timer which is great for energy savings and security. The hard wire mount plate discreetly conceals the wire to flawless fit to your decor. Gorgeous in bathrooms and full of possibilities for laundry room, exercise room or mudroom - it's a sure upgrade to make life better. The WarmlyYours Sierra Towel Warmer is manufactured with flawless construction that ensures lasting beauty and durability. With eight sleek, horizontal bars, it easily dries and warms large towels or bathrobes. The Sierra comes with a programmable timer and on/off switch, allowing you the flexibility of setting it in advance so your towels are warm and ready when you step out of the shower or bath. The Zen-like design is finished in elegant, polished stainless steel and is perfect for creating a tranquil spa environment right in your own home. 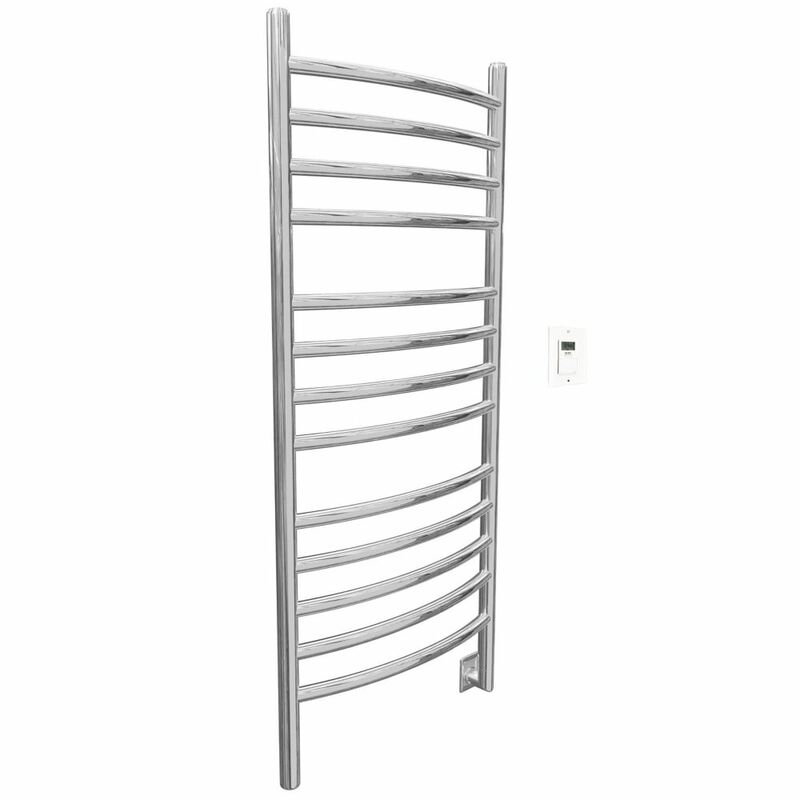 Svelte Rounded 40 inch Hardwired Electric Towel Warmer in Stainless Steel Polished SS with Timer Your lifestyle will turn into constant comfort and convenience thanks to the Ancona Svelte Rounded 40 inch Wall Mounted Hard Wire electric towel warmer and drying rack. The meticulous design provides 13 racks for luxuriously warm towels after showering, as well as drying them after use, keeping them fresh between laundering. The Svelte Rounded Hard Wire includes the additional feature of a 24 hour 7-day digital timer which is great for energy savings and security. The hard wire mount plate discreetly conceals the wire to flawless fit to your decor. Gorgeous in bathrooms and full of possibilities for laundry room, exercise room or mudroom - it's a sure upgrade to make life better. Svelte Rounded 40 inch Hardwired Electric Towel Warmer in Stainless Steel Polished SS with Timer is rated 3.0 out of 5 by 8. Rated 4 out of 5 by Jackie27 from Good Towel Warmer We are happy with this product, we have limited space and the Towel Warmer holds large bath towels. I have also used it to quickly dry hand washed items. The only downside is that there is no temperature control. Rated 5 out of 5 by Ilona from Towel warmer Good , reliable product, helpful in our long Canadian winter . Will recommend. Rated 2 out of 5 by Fuzzybear from Just OK Nice looking and the perfect size but unfortunately it takes too long to warm up. Rated 1 out of 5 by Frances from Don’t waste your money. Does not heat towel very well. You can put only one large towel on it. Towel still cold when you’re done showering. Rated 4 out of 5 by victoria catherine from needs warm up time After travelling in New Zealand where every household has towel warmers, we had to get this upon getting home. It’s perfect to get the towels dry in the bathroom and having warm towels for after a shower.